Oceanize is a student start-up company that is installing free photo-copying facilities in Tokyo Universities. The facilities are completely funded through corporate advertising on the back of the photo-copy papers. The ‘free’ part is very attractive to students and the facilities are getting heavily used. The advertisers are attracted to it because of the sizeable student population that they can easily reach and the ads stay with the students longer. James’ recent article on ‘Why give FIFA 07 away for free in Korea?’ talked about the trend of offering free products supported on advertising revenue. 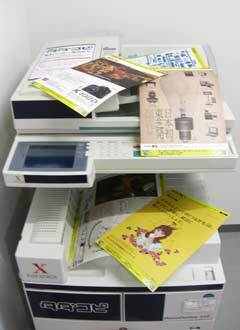 The free photo-copying facilities are another example of the same trend. Entry filed under: japan, media general, trends. I don’t know much about marketing, but this sounds like a great idea to me… Then again, I am not a business man. Not yet.